You know what I hate? Suggested serving sizes. I love hummus. I don’t make usually make hummus myself (unless it’s Edamame Hummus) because it ends up being a disaster, so I buy the little tubs of hummus at the grocery store. And I totally want to eat half the tub in one sitting. But a serving size is almost always two tablespoons. Two tablespoons. Which is nothing! Who eats two tablespoons of hummus?! I am totally a volume eater. Hummus is a healthy food, but the calories really add up when you want to eat more than two tablespoons. So I thought I’d try replacing the chickpeas with roasted cauliflower. Oh sure, my hummus wouldn’t have as much protein, but I’d be able to eat a lot more of it, which is nice too, right? As usual, I thought I was being super innovative, but then I Googled it and about a gajillion recipes for paleo hummus made with cauliflower came up. Oh snap. 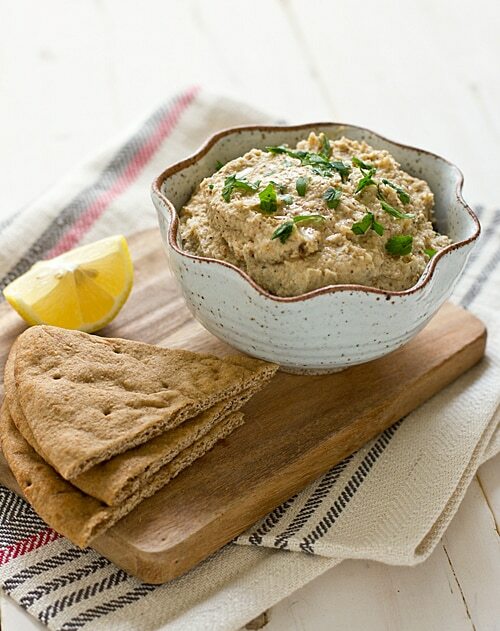 Anyway, if you divide this Roasted Cauliflower Hummus into four HUGE SERVINGS (see, all caps means the servings are big), you end up saving about 90 calories per serving. I kind of wanted to have a more impressive number for you, but 90 calories is better than nothing, right? Each HUGE SERVING is a little over 200 calories, so if you serve this with some whole wheat pita bread and fresh veggies, it makes a nice light lunch. Oh, and I bet you’re wondering how it tastes. Does Roasted Cauliflower Hummus taste like real hummus? Well, yes and no. With the garlic, lemon juice, and tahini, it does taste like hummus, but because it’s made with roasted cauliflower, it has a subtle sweetness and nuttiness that regular hummus doesn’t have. If you’ve ever added caramelized onions to hummus, it’s kind of like that. A lower calorie hummus with roasted cauliflower substituted for chickpeas. Preheat oven to 400 degrees. Line a rimmed baking sheet with parchment paper or spray with oil or cooking spray. Place cauliflower florets on baking sheet. Spray with additional oil or cooking spray. Roast for 40 minutes, stirring halfway through cooking time. Remove from oven and cool. Combine cauliflower, garlic, tahini, lemon juice, olive oil, salt and pepper in food processor. Process until smooth. Add water one tablespoon at a time for a thinner consistency, if desired. Drizzle with olive oil and sprinkle with parsley, if desired. Serve with lemon wedges, pita bread, and fresh veggies. I’m actually working on a cauliflower dish now too! I think our bodies totally crave it. But I must admit that I’m anxious to try this hummus! So creative! I can’t wait to see your cauliflower recipe! I feel like cauliflower doesn’t get much love from people, but it’s one of my favorite veggies. The crazy thing is that it tastes like caramelized onions without the onions! But still, caramelized onions make everything even better, right? I love cauliflower but I never would have thought to make hummus with it. Bravo! I totally love roasted cauliflower, so i Know I would love this! What a fantastic idea! Though that roasted cauliflower looks so good all on it’s own. Not sure it would make it into my humus! What a great hummus idea–totally trying this! I read labels obsessively. I miss the days when I didn’t. Life was so much easier! what a great idea, lady! i’m with you- i’m a total volume eater. i would eat half this batch in one seating, hands down. and now i definitely have to try it out! I think my husband did eat half a batch in one sitting. 🙂 And that’s okay! I am totally a volume eater. And I would love to eat this whole bowl. Great idea! I’m always a little shocked when I come up with an idea I *can’t* find on Google! That’s a pretty rare thing. Sigh. I am SO making this! I miss hummus like crazy and most of the other versions I found were made with tons of nuts – which I can’t eat. Yum! I hope you like it! It is really good. Sweeter than regular hummus, but the consistency is spot-on. I’m so willing to eat my very large portioned part of this! Pinned! Love it! Can’t wait to try! About how long will this keep in the fridge? Any suggestions for storage? clever. maybe this is a way for me to actually eat cauliflower – not my fav veggie. How do you know that I have just bought a head of cauliflower! I love this hummus and can’t wait to try it! It looks yummy but I LOVE my chick peas. I can’t only eat 2 tablespoons of hummus, I eat more like 10 tablespoons of hummus…and then I regret it later. I am going to have to try this recipe, maybe I won’t feel so bad for eating so much. Just so you know, I thought you were being pretty darn innovative over there with your cauliflower hummus, so you still get a big high five from me! Well, if you don’t like hummus, you might not like this! But I know what you mean, I have trouble getting hummus right when I make it too. The only recipes I’ve had success with were ones that didn’t use chickpeas! I’m making hummus today too! however, I’m bummed that I did not check your post earlier because I want to make YOUR hummus! this looks delicious. 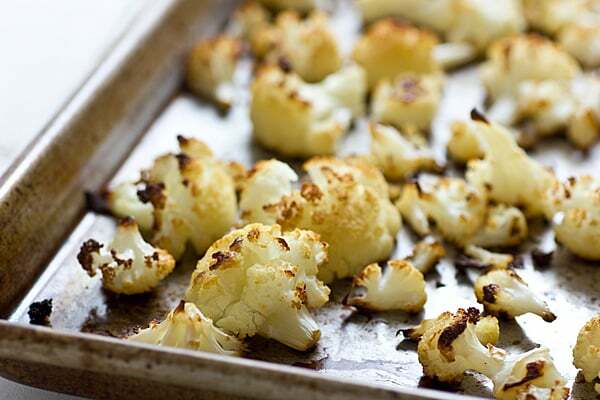 I love roasted cauliflower, and I definitely love saving calories! I hear ya on the whole googling an idea you think is original and then BAM right in your face! I know, it’s the worst when you think you have an idea that’s REALLY unique and then you find out it’s not. Sigh.